While I was out of town for the week, my daughter decided to make a quad line kite to fly. Susan got a picture of her trying to take it out and fly. I think it needs a few design adjustments, but she's off to a good start. Excellent! You must be so proud to have a kite maker starting out at this early age. She is just waiting to be able to go back to the field/beach with her dad again. Soon we will the form the 180 Go Jr. kite team. Pkrekel wrote: Soon we will the form the 180 Go Jr. kite team. Last edited by Jeepster on Tue, Sep 16 2008, 12:30 PM, edited 1 time in total. 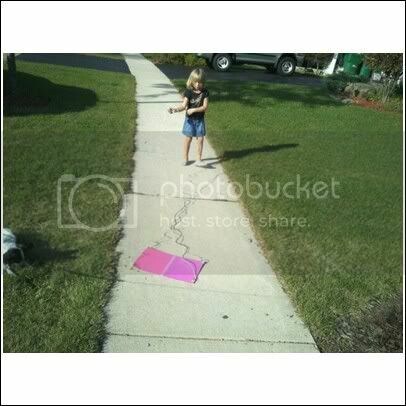 Jeff wrote: While I was out of town for the week, my daughter decided to make a quad line kite to fly. Susan got a picture of her trying to take it out and fly. Actually, she looks like she has my low wind technique down pat ... when the wind is low, so is my kite. How old is Susan ... I ask because I'd like to get my grandson interested. At four years old, he simply doesn't have the attention span yet. I don't think Susan wants me to say. But Kayla is 4 years and 9 mos. She is interested, but doesn't quite get the concept of controlling a kite. She will pull and yank on a single line kite as if she's trying to fly a sport kite, since that's what she sees me do when I fly my Revs. Last edited by Jeff on Thu, Sep 18 2008, 03:44 PM, edited 1 time in total. Now where did I leave my walker?